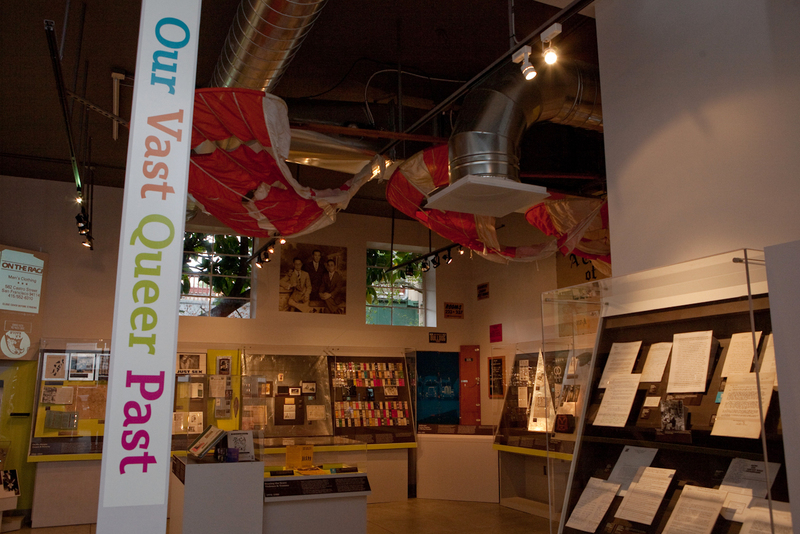 The GLBT History Museum opened January 13, 2011, near 18th and Castro Streets in San Francisco. My friend Steve Const, who was the architectural designer for the museum (with Kuth Ranieri Architects), invited me to the opening. Mayor Ed Lee was there, as was former District 8 supervisor Bevan Dufty, current District 8 supervisor Scott Wiener, and a lot of people who were part of the history being shown, including Phyllis Lyon, Cleve Jones, Daniel Nicoletta, and Armistead Maupin. As I walked around the exhibit, I heard people telling stories of their own histories. I heard laughter and tears. Although the space is relatively small, it was designed and curated to a high standard. It is a storefront museum in that it is right on the street near several watering holes, but it feels like a museum, a grassroots kind of museum. This is due to the diverse leadership, but also to the fact that a lot of the beautifully crafted exhibit cases came from the de Young Museum. I thought it would be interesting to ask a few people who I either met or knew what the new museum means to them. Daniel Nicoletta working at Castro Camera. 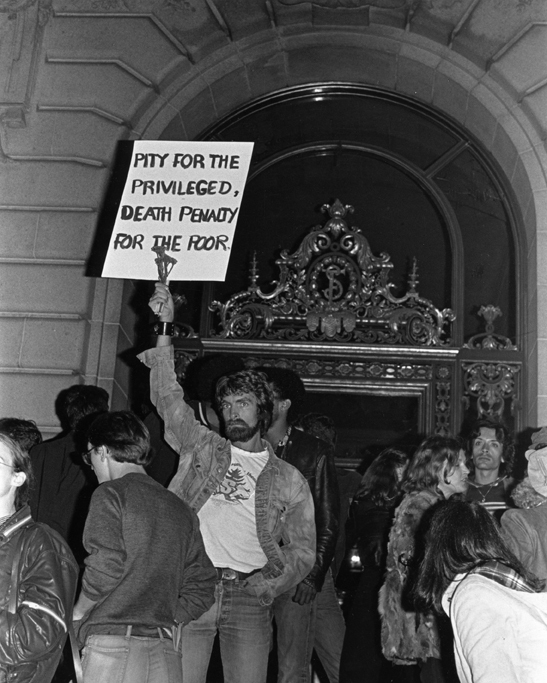 Photo by Harvey Milk. Circa late summer/early fall 1976.
at the James C. Hormel Gay and Lesbian Studies Center, San Francisco Library. I was really excited to be invited. My friend Deborah St. John, who is a fellow photographer, was my date. She has been covering the queer scene for many years as well. We were both very excited. It was a low-key evening full of poignant speeches. I thought they did a marvelous job and it came off without a hitch except for the little leak in the ceiling. I looked at all of those exhibits and thought, “God that’s my life.” There is always some little quirk that is a message of some sort. I am a huge supporter of the Gay, Lesbian, Bisexual, Transgender Historical Society. They will be able to show my work beyond my life on the planet. I am constantly using the organization for my own research and creative work. In the vitrine in the middle of the room was a handmade binder which held tributes to Shanti project clients. They elected to open to a page about Leland Toy. I have been looking for Leland Toy for many many years because he is the creator of the image of the human billboard, which was Harvey’s strategy. Stand on Market Street and wave to commuter traffic. This picture was in Harvey’s negatives. Years later when I was printing images for dissemination, I tried to find Leland Toy, but I couldn’t find him. So we were doing the research for the Milk film. There is this amazing iconic image out there. But we couldn’t find the creator. Of course, I would credit him, but I would have my heart in my mouth because I couldn’t find him. Sure enough, he did pass away from AIDS. It was a complete circle to know who he was. And then in the middle of this opening show I find a full-page description about what kind of life he led. I was brought into the project by Bob Michitarian, who helped negotiate the lease and improvements with Walgreens, and then began working with Paul Boneberg, the Historical Society's executive director. In developing the architecture of the space, our goal was to foreground the collection and the exhibits. When you have a very modest budget, sometimes it makes sense to use the architecture in less obvious ways. The focus of the design was on the presentation of information. We didn’t want the design to overshadow what was said by the institution or any single exhibition. The design does not shout. I think there is a balance there. For example, we needed to sequence the entry experience past the all-important gift shop, yet make places for people to pause and converse or reflect. Even with input, the design process is fairly insular. We have been kind of buried in the archive. Then suddenly the diversity and beauty of the LGBT community is revealed and played out in space, not as an abstract idea. 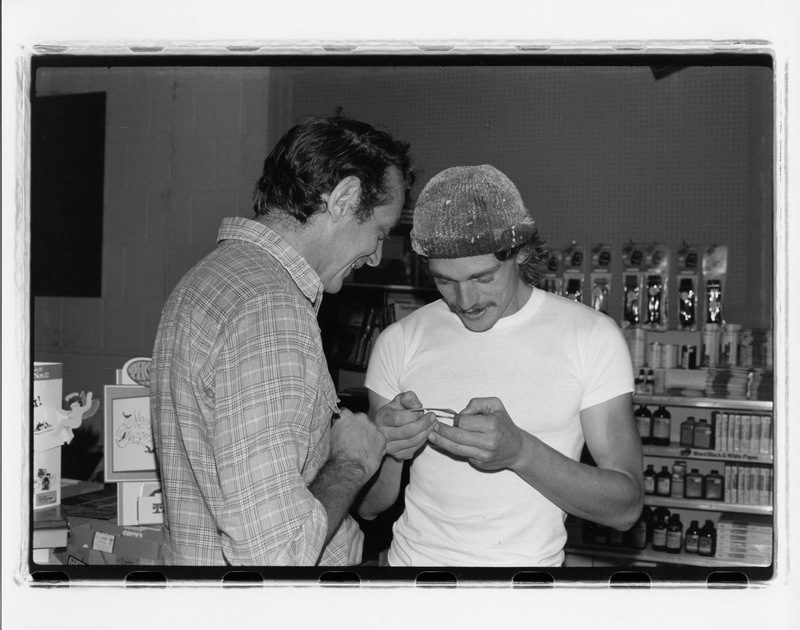 People from all walks of life, from 20-year-olds to legendary pioneers, were mingling. I met the folks who keep the LGBT Historical Society functioning, from administrators to curators and donors. And I met members of the larger community that I had never known. I have to admit, it was great to be recognized by politicians like Mayor Lee, former supervisor Bevan Dufty, and current supervisor Tim Wiener. That means that what we are doing is not going unnoticed. I hope it is not too grand to say that we felt unified. As a native San Franciscan now in my 40s, I was impressed by how important each of us is in terms of our shared history. It was thrilling to celebrate GLBT San Francisco's gateway to a history that's still being written. My involvement has been mostly as an observer thus far, but I am working to change that with a few projects I’ll hopefully be helping Paul and the board with over the next several months. My partner Peter, on the other hand, has a much more involved role, over several years, and so he will have a different take on things. Many of my memories are from growing up here. 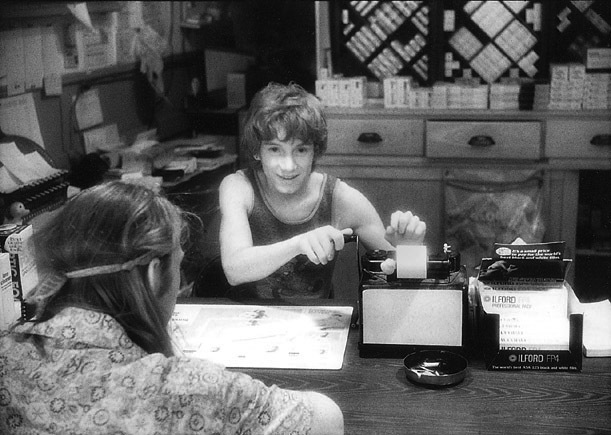 I was a huge fan of the Chronicle and Tales of the City, which I used to read every day (weird kid)! I also remember ABC KGO News with Van Amburg, and so I think these were the places that I’d see reports in real time on Anita Bryant, Harvey Milk, and what was happening in the Castro or related to the gay community (before I was an out adult and in the milieu). 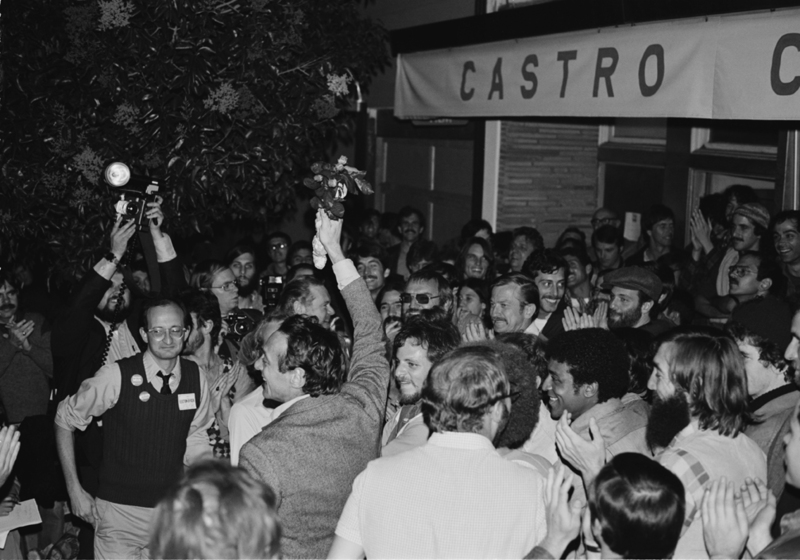 I remember that as soon as Mayor Moscone and Harvey Milk were shot, it was announced over the intercom at school. Many of us kids (all in the 6th grade) were crying. I was so shocked and a bit scared. I knew of both figures since I followed the local news. The most tangible experience on this front was walking on the steps of the State Building across the street from City Hall just a couple of days after the White Night Riots. I was with my mother, oddly enough. The State Building steps were still spray painted with lots of graffiti from the protestors, and I remember seeing City Hall totally shut down, with all the broken glass windows. 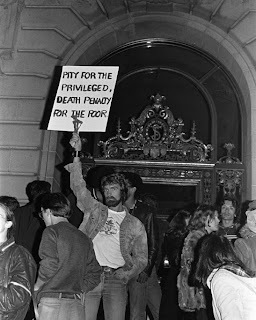 Living in the Castro in the early and mid-1990s was a scary introduction to AIDS, having friends and coworkers succumb to it. But it was also a great time. My favorite exhibit? Definitely Mary Ann Singleton’s dress from Tales and the City, donated by Laura Linney to Armistead Maupin. I was introduced to the GLBT Historical Society in 1998 with a tour of the archives by Gerard Koskovich, when it was located in the mid-Market area. 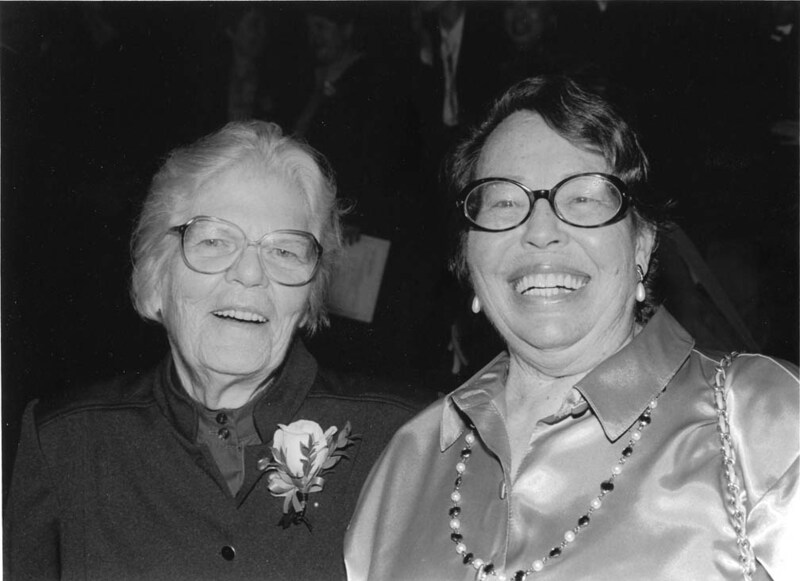 Susan Stryker was the executive director at the time. I was blown away. I had never thought about gay history and historical societies. Sounded dusty and old. I was stunned by the realization that who I COULD BE TODAY was the residual effect of so many people over periods of many lifetimes, many of whom we would never know about because they were ordinary people, like myself, going through daily struggles of life, just wanting to love, be loved, and be happy. (Over the years, I saw this same reaction in the eyes of hundreds of people who visited exhibit openings and events at the archive offices on Mission Street). I asked how I could become involved and was invited to join the board. Well, after nine years on the board (eight as president), I saw the organization grow from a budget of $100,000 to more than $500,000, triple the space, mount exhibits in the archive space on Mission, and finally open of the current full-fledged museum in the Castro—our dream come true. However, the real strength of the organization (and coming from a corporate background, I did not really understand the importance of this) is the involvement of the community. The board is dynamic in its diversity—cultural, social, gender, and professional. Corporate (like myself), academic, archivist, activist, transgender, ethnic. And there is one common element in the continued success and growth of the society. This is an extraordinary high level of passion for the mission of the Historical Society. This also makes for interesting and challenging discussions in the board and community. Board members are super volunteers and argue their points of view passionately. The result is actions, policies, and directions that go beyond what any one person could have ever imagined. The GLBT Historical Society and Museum is truly an organization that holds, preserves, and tells ALL our stories. It deserves and must be supported by every GLBT person with financial donations, large and small. Every dollar is significant. The line of people, going around the corner, waiting to get into the museum, on opening night brought tears to my eyes. Chatting with people who have made the museum happen—volunteers, politicians, donors, celebrities—reminded me how important this museum and the Historical Society is to so many people. My favorite exhibit was in 2004, “Sporting Life,” which explored the growth of gay and lesbian sports groups, Gay Games, and the impact this movement has had on the self esteem and outside image of gay people. I talk endlessly about the society and museum to friends and take them all to the archives and museum when they are visiting. It will be the Castro’s next international attraction.